I often hear people say that we are fortunate to be living in these high tech times because of the ease with which we now have access to information and education at the click of a button. While I agree in principle with this view, when it comes to investing in the stock market this can lead many down the wrong path. Particularly, when you see advertisements from companies making promises that just about anyone can invest in or trade the stock market with very little knowledge or time. But trading is not just about buying and selling the next hot stock, it is about managing your investment risk so that you can consistently build wealth over the long term. Given this, my intention with this article is to share with you a number of strategies that will help you to manage your risk in the stock market, so that you can build a profitable portfolio. When undertaking research for my bestselling book, How to Beat the Managed Funds by 20%, I identified that if all anyone did was buy and hold the top 10 shares by market capitalization over 10 years, their portfolio would return around 12 percent per annum. While this approach requires almost no knowledge or time, a buy and hold strategy will expose your portfolio to major swings in the market. But with a little bit of knowledge, not only can you increase your overall return, but more importantly, you will be able to limit your downside risk. You can find the top 10 stocks by market capitalization for an exchange on the Standard & Poors website. Market capitalization is used to determine the dollar value of a company and is calculated by taking the number of shares a company has on issue and multiplying it by the share price. The stocks are then ranked from the largest company down to the smallest. To find the top 10 stocks on the Australian Securities Exchange, for example, you would search for the S&P/ASX200 on the Standard & Poors website and then click on the constituents tab. While this is the simplest method for managing your risk in the stock market, a more active investor, as the name suggests, would be more proactive in selecting stocks and managing their portfolio. So let’s investigate how to do that. Another approach to managing risk is to select stocks that fit with the investment goal of your portfolio. You can then develop a watch list of stocks to suit your investment goals. Outlined below are two different types of portfolios and some guidelines to assist you in the selection process. This type of portfolio is best suited for people with a low tolerance to risk who are seeking a stable income and steady growth with returns of between 10 to 20 percent per annum, including dividends. Given this, a blue chip portfolio is generally constructed from the top 50 companies on an exchange by market capitalization, with one or two stocks selected from the top 50 to 100. A blue-chip portfolio is suited to investors who have up to two hours a month to manage their portfolio once it is established. This portfolio is suited for those investors who are more risk tolerant and willing to spend more time getting a better return on their investments. A growth portfolio generally aims to achieve a return of 15 percent plus dividends, while accepting fluctuations in income and capital, with a view to achieving capital growth over the medium term. The portfolio would be constructed using a mixture of the top 100 stocks by market capitalization. Stocks from the top 50 would make up 60 percent of the portfolio and 40 percent would be selected from the top 51 to 100. This would give you stability from stocks in the top 50 combined with the growth potential of stocks in the top 51 to 100. This type of portfolio is more suited to those who have at least one hour a week to manage their portfolio. You will also be more profitable because you will spend more time getting to know the stocks that are relevant to your portfolio, which will enable you to pick the best stocks more easily. As I outline in my four golden rules to investing in shares, when constructing a portfolio, you should always aim to hold between 8 and 12 stocks so that you have a well-diversified portfolio. So, how do you select the best stocks to place in your portfolio? Two methods that have proven very valuable for both professionals and investors alike include fundamental analysis and technical analysis. Fundamental analysis is simply value investing or using information to ascertain which stocks are under-valued in relation to the current price. 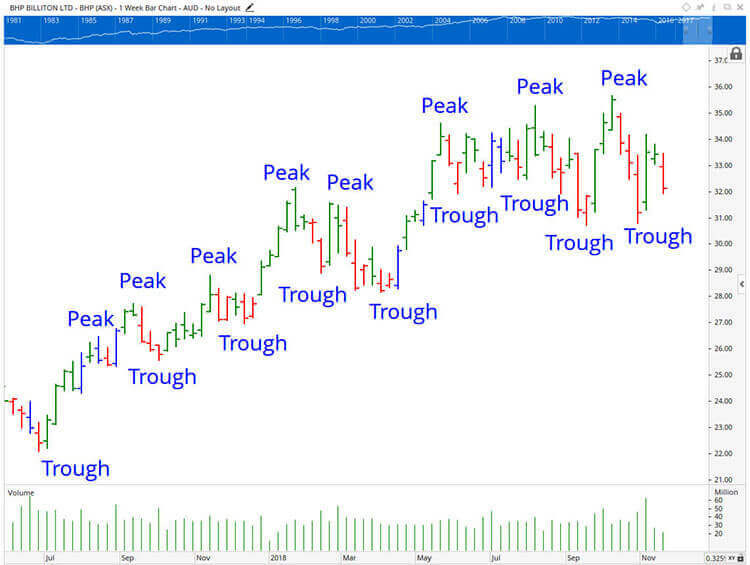 Technical analysis, on the other hand, involves looking at historical data in the form of charts to discern patterns in the behaviour of a stock. While many have a preference for using one form of analysis over the other, I tend to use both. I find it helps to narrow down the selection of stocks into a very manageable level. That said, selecting the right stocks for your portfolio will depend on the time you have available, as well as your level of knowledge and skill. If you use an online broker you will have access to the fundamental data of a company. In my experience, one of the most important aspects of fundamental information about a company is its earnings per share, as it indicates the profitability of a company. Therefore, you want to find companies that deliver results as this can lead to a rise in the company’s share price. If the earnings are consistently increasing, it suggests that the company is well managed. 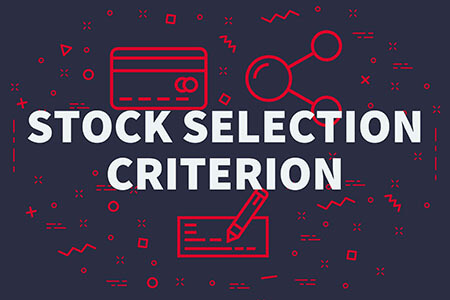 To learn more about the fundamental criteria I use to select stocks, read my market report on how to pick stocks to invest in. Unfortunately, many shy away from technical analysis believing it is overwhelmingly complex. But what I want to demonstrate to you is that using it in its simplest form it can be a very quick and powerful technique for filtering stocks. There are those in the industry who ridicule this form of analysis, believing it is of little or no value. But the information you gain by simply looking at a stock chart can tell you whether a share is rising or falling in value. In other words, it provides a clear representation of the overall trend of the stock. You would not see this by looking at the fundamentals of a company. Therefore, you can use this information to narrow down your list of stocks by selecting those that are rising or trending up and avoiding those that are falling away or trending down. If you look at Figure 1 below, you can see that this stock is trending up, as it has consistently higher highs and higher lows. If all you did was buy stocks that are trending up strongly and sell those that are falling away, you will be well on your way to generating some nice returns on your portfolio. 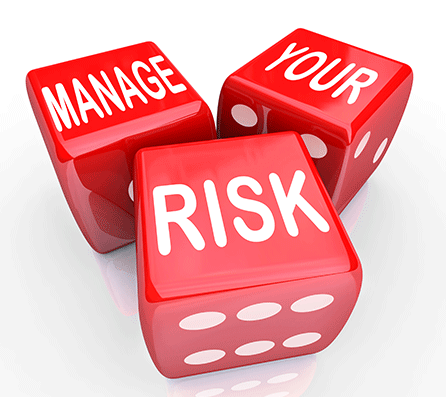 Once you invest in the stock market, it is prudent to use a stop loss to manage your risk. A stop loss is simply a method of protecting your capital if an investment turns sour. In most cases, you would set a stop loss at 10 to 15 percent below your buy price, depending on the volatility of the stock. For example, if you buy a stock at $10.00 and set a stop loss of 10 percent, you would sell once the stock fell $0.01 below $9.00. Obviously, where you set your stop loss will vary depending on your tolerance to risk. That said, I recommend you never set your stop loss less than 10 per cent when trading blue-chip stocks, otherwise, you will get stopped out of trades - some of which could potentially be very profitable. In my experience, if you invest in the top stocks on an exchange by market capitalization and take a low-risk, methodical approach to investing over the medium to long term, you will achieve your financial goals. Obviously the more knowledge you acquire, the more confident you will become, which will lower the risk you take when investing in the stock market. And if you would like to learn how you can manage your investment risk in the stock market so that you consistently profit, review our trading courses. You can also check our what our clients have to say about their success in the stock market by viewing their reviews and testimonials. Are You Interested in One-On-One Mentoring From Australia's Most Respected Trading Experts?